Department of Resource and Environmental Economics (ESL), Faculty of Economics and Management, Bogor Agricultural University (IPB) in collaboration with AIESEC (Association Internationale des Étudiants En Sciences Économiques et Commerciales or International Association of Students in Economics and Management) IPB, held a summer course and hosted student participants from far-ranging countries and continents, namely China, Egypt, India, Russia and South Korea. 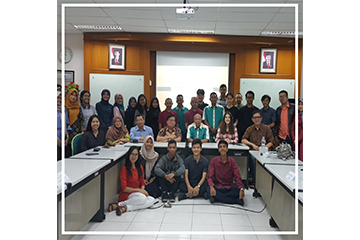 The opening of summer course was officially held on January 17th, 2019, in IPB Darmaga Campus, Bogor. Head of Department—Dr. Ir. Ahyar Ismail, M.Agr., declared the summer course execution was to realize the ESL study atmosphere’s internationalization. At the end of 2018, the department has organized a joint seminar with Universiti Putra Malaysia and Dr. Ahyar underlined his expectation that such programs can be projected annually. Recently, collaboration with Adelaide University (Australia) was initiated and wishfully to be forwarded for international seminars proposal. Secretary of Department who is also ESL-AISEC IPB joint summer course initiator and AISEC IPB supervisor—Dr. Meti Ekayani, S.Hut, M.Sc. defined that AIESEC is an international organization for youth with aspiration for leadership potency development. It is among World’s largest organizations which focuses on developing youth leadership and becoming ambassadors abroad to run social projects. AIESEC also focuses on leadership development, leadership experience, and participation in the global learning environment. It was first time for ESL-AIESEC IPB joint summer course to be established, where previously ESL acted solely as host of AIESEC inbound activities such as global summer volunteers in July 2018 with 20 participants from 10 countries and in July 2017 with 9 participants from 4 countries. The activity carries the environment and community empowerment theme in ESL partner villages where one of AIESEC volunteer global social projects take place at. Therefore, starting in 2019, summer course combining theory in class and practice in field was conceived. It is hoped this summer course can be held twice a year, in January and July, and lasts for six weeks each. Participants lived with Indonesian families for them to acknowledge Indonesian culture deeply. Through this summer course program, students accomplished many benefits, such as sharpening language skills, learning to design and create social projects, and reporting social projects results. During his warm welcoming remarks, Dean of Faculty of Economics and Management—Dr. Ir. R. Nunung Nuryartono, M.Sc. looked forward that students are not only limited to be involved in academic activities but also to make real contributions to the world. The opening was also attended by IPB Vice Rector for Collaboration and Information Systems—Prof. Dr. Ir. Dodik R Nurrochmat, M.Sc., Chairman of Bogor City Tourism Promotion Agency—Zaenal Syarifudin and several AIESEC local partners.